Milwaukee Tool Cordless LED penlight provides Trueview™ high definition output of 100 Lumens. It features LED light technology with lamp life of 50000 Hours and offers beam distance of 43 mm. It has protective rubber bite zone, which allows user to perform two handed tasks. This waterproof and dustproof penlight has ON/OFF and momentary ON button. 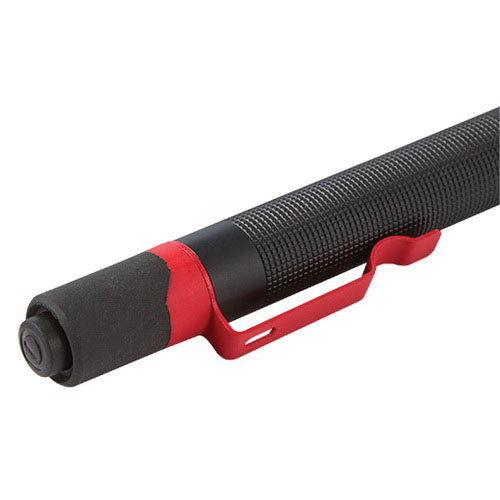 This penlight with red colored aluminum body and polycarbonate lens, offers impact and chemical resistance. It has removable metal clip, which can be attached to chest or pant pocket for quick and everyday use. It includes two AAA alkaline batteries. It is suitable for vehicles. The LED penlight is UL listed.